President Muhammad Buhari of Nigeria returned to the country on Friday, after 49 days abroad for medical vacation. However, Buhari may be returning in few weeks for further check up, because results from his medical examinations and follow ups were inconclusive, according to a statement he made to his cabinet on arrival. A statement released by Femi Adesina, the president's media assistant, said that a letter will be forwarded to the National Assembly on Monday, informing it of the president's arrival and readiness to get back to work. 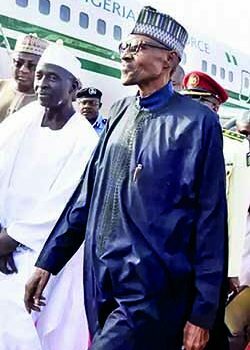 Many Nigerians are happy to see their president return home, after what people consider a long stay abroad. It is the reason observers say it is not surprising there are reports about wellwishers slaughtering rams to welcome the president. The Punch newspapers' report have photographs of a large number of Nigerians, who fill a street in celebration of their leaders' arrival home, and other slaughtering rams. While President Buhari was away, Vice President Yemi Osibajo has acted as president based on a request by Buhari to the National Assembly, prior to his departure for medical vacation. However, it was noted, when Buhari left Nigeria, Osibajo was in Davos as the leader of the country's delegation the the economic summit there. Osibajo hurriedly departed Davos, returned home and assumed the responsibility of overseeing the country's affairs in the absence of the president. The near mix up of the arrangement of Buhari's travel and Osibajo's mission to Davos, and the need for hurrying back home made many Nigerians asked questions about the state of Buhari's health, while some others said things, which some officials in the presidency termed to be death wish for Buhari by his enemies. Consequently, many Nigerians wanted to know the state of Buhari's health as reported by the news media, and the president's media representatives said he was hale and hearty. And since then, the cliche "Hale and Hearty" has gained currency in the country. News reports from Nigeria show that there are celebrations heralding the president's arrival from medical vacation, while he also offer thanks to Nigerians for prayers and support. There is no report of protesters with placards to inform the president of the report of hunger in the country, and the news that the country is listed among four countries around the world that are under the threat of starvation.